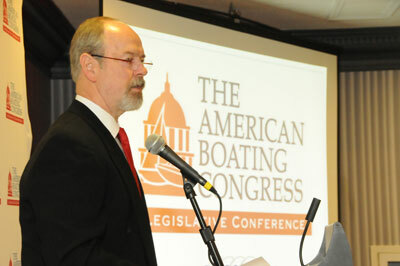 An estimated 150 marine businessmen and women from around the nation descended on Capitol Hill May 6 to attend the American Boating Congress and talk legislation with their congressional representatives. “We’re going to be talking to the key decision-makers, those who affect your business and mine,” said National Marine Manufacturers Association chairman David Slikkers in his opening remarks. The CEO of S2 Yachts, builder of Tiara and Pursuit boats, says the industry has been challenged by a “massive economic downturn” and a “new political environment requiring constant attention and vigilance” to beat back regulatory initiatives adversely affecting the industry. “We have many pressing issues, but also many opportunities,” he says. Top on ABC’s agenda was an opportunity to talk to lawmakers about changing two lending programs the Small Business Administration administers through private lenders. The changes would make the programs more attractive to lenders and deliver credit to more small businesses — boat dealers in particular, who continue to have trouble getting floorplan loans at affordable rates. The industry wants the ceiling on the so-called 7(a) program raised from $2 million to $5 million and the program extended from a one-year pilot venture to a full five years. Lenders prefer bigger loans because they are more profitable and a program with a longer life span that gives them more time to recoup their investment — the costs of gearing up for it — says lending consultant Bill Thompson. The 7(a) loan money can be used to buy machinery, equipment, furniture, fixtures, real estate, inventory, supplies — and to finance floorplan. Under the pilot program, SBA had hoped to issue 4,000 loans the first year, but because of the program’s shortcomings it issued only 62. Industry volunteers who fanned out to Capitol offices also asked for amendments to the SBA’s so-called 504 program, a fixed-asset program that provides long-term financing for real estate, equipment or expansions. These loans are delivered through certified development companies, with only a portion of the loan underwritten by a bank. Thompson says the industry is asking Congress to increase the loan cap on 504s from $2 million to $10 million, and to permit refinancing under 504, which now is restricted to new loans. Credit likely will remain tight, however, until more lenders return to the marine industry and to floorplan lending, says Donald C. Parkhurst, senior vice president for marine and RV finance at SunTrust Bank. Jim Coburn, a former banker and business consultant, points out, too, that while banks are reluctant to renew floorplan loans for businesses that show unhealthy balance sheets, they sometimes will renew with a struggling business that shows consistent improvement. Thompson says small community banks — those where relationships are key — are the best sources now for securing floorplan financing, but he says a dealership’s health still is a big factor in getting loan approval. Keynote speaker Charlie Cook, political reporter and analyst for the National Journal and NBC News, predicted significant Republican gains in the midterm elections that could give them a majority in the House and just short of that in the Senate. “I think the Republicans could take the House back, if the election were held today,” he says. However, he warned that midterm elections are seldom good predictors of the next presidential race. He says voters’ willingness to vote the Republicans back in so soon after voting them out reflects several things. 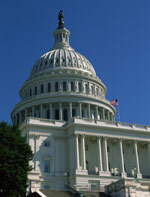 Mayland is forecasting 3.6 percent GDP growth in 2010, based on increased consumer confidence, a lower personal savings rate, rising production and inventory, a turnaround in the housing market, auto sales and capital spending in several key states, export growth and more fiscal stimulus spending. 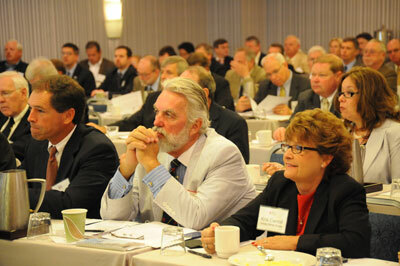 For more on the American Boating Congress, see the June issue of Soundings Trade Only.